The U.S. National Home Price NSA Index rose 6.2 percent in September, according to data from S&P CoreLogic Case-Shiller. The index is rising “at the fastest annual rate since June 2014,” S&P Dow Jones indexes managing director David Blitzer said. 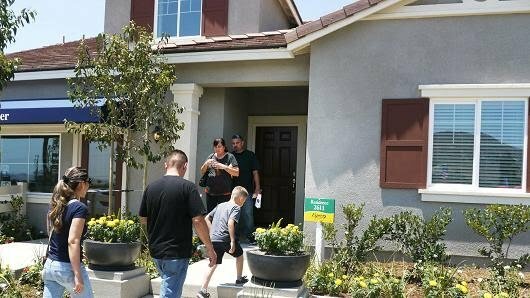 Prospective home owners tour a home in Jurupa Valley, California. The S&P CoreLogic Case-Shiller home price index rose more than expected in September in a continuation of this year’s momentum. National home prices continued to rise in September, reporting a 6.2 percent annual gain on the S&P’s most broad indicator. This was better than the 6.1 percent increase expected by economists polled by Reuters. The latest report was a gain from the 5.9 percent revised increase in August. Another key index, which covers home prices in 20 cities across the U.S., registered 6.2 percent in September, up from 5.9 percent in August. Seasonally adjusted, 13 of the 20 cities in the composite reported price increases in the year ending September 2017. Seattle, Las Vegas, and San Diego reported the highest year-over-year gains among the 20 cities.